Actually it was only a matter of time when the label with the horse meets up-and-coming acid techno advocate from London. 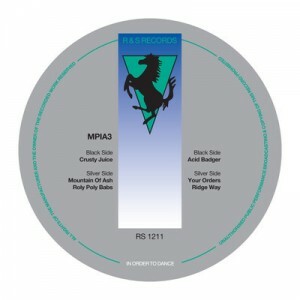 From 1990 onwards R&S Records heavily contributed to the foundations of the European techno and therefore signing with MPIA3 an artist reanimating the sounds from that era is a lovely idea. So after two stunning EPs on Avian, MPIA3 drops six fierce tracks for the Belgian cult label, which has not experienced such a gallop since its revival. “Your Orders” is dedicated to distorted acid workouts and we go straight to the real business when the double pack is introduced with “Crusty Juice”, a 128 BPM kick drum onslaught fishing happy grins from anarcho-hippie-vagabonds of the raving UK. A long track that will smash the floors as did “Ely” and the same can be expected from vigorously biting “Acid Badger”, another piece with angry bass lines. Hammering goes on in the crunchy title track “Your Orders”, stumbling along industrial breakbeats and nasty acid bleeps. The switch is kept in overdrive mode in “Ridge Way” which bangs with full force and Caustic Window’s fingerprints can be deducted in shortish “Roly Poly Babs”. One track falls out from the main theme and in my humble opinion “Mountains Of Ash” on B1 is the best cut here. By sound texture it’s like a flashback from the archives with booming bass and tuxedoed vampire doing the vocal part, all going back to the R&S basics with hints of early Kevin Saunderson. This 2×12″ is a real hormone booster and a trusted companion for any DJ with hardliner ambitions. Great stuff, v nice, but I don’t know how MPIA3 is an “up and comer” since it’s just an alias for Truss, who has been doing stuff for a long time. Sure it’s Tom but MPIA3 is still quite a new project, that’s what I meant.